Kiran Bedi is one of those very few women who have dared to voice her own opinions and take very bold decisions in a male dominated job environment in a patriarchal society. Born on June 9,1949 at Amritsar in Punjab, Kiran Bedi is a retired Indian police officer, the current Lieutenant Governor of Puducherry, a former tennis champion and an eminent social activist. She stands as a true icon of valiance encouraging women of India to work hard for their ambitions. Kiran Bedi is the first Indian woman to join the ranks of an IPS officer in 1972. She remained in service for 35 years before taking voluntary retirement in 2007 as Director General, Bureau of Police Research and Development. Kiran Bedi, a bold and confident woman who strictly followed her heart, without succumbing to the social demands from the Indian society. Kiran Bedi kick started her education with a degree in Bachelor of Arts in 1968, a topper in Masters degree in Social Science, Law degree from the Delhi University in 1998 where alongside she worked as the Direct General of Police, and a final degree of a doctorate in Social Science in 1993. Throughout her career, she kept elevating to positions in every field she stepped into. Oh yes, she was also a former National and Asian tennis champion. Talk about versatility! Kiran Bedi has served as the Director General of India’s Bureau of Police research and development and a Police Advisor in the UN peacekeeping department. Her exceptional and conspicuous performance landed her an honorable UN medal. 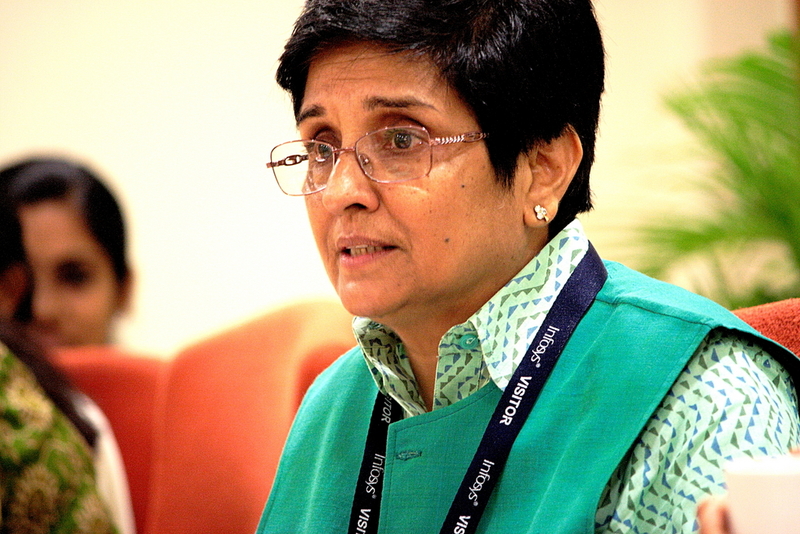 Kiran Bedi is known for her exceedingly active level of participation in social issues. Seeing the troubled and lack of amenities available to women and people with a low economic status, she co-founded an NGO along with fifteen policemen named Navjyoti India Foundation (NIF) in 1987. The main aim of the NGO was the rehabilitation of drug abusers, women empowerment and promoting education. Kiran Bedi’s dedication to serve the people of the nation is beyond comparison. She has always been really keen on improving the rural condition, child welfare, police and prison reforms due to which she established a foundation named India Vision Foundation in 1994 for the above causes. Kiran Bedi not only inspires Indian women but people from all over the world with her honesty, will-power and determination to bring change. The efforts put in by Kiran Bedi has given her global recognition and made her the recepient of many honours. She has received appreciation for the work which she has been done completely on her own. Kiran Bedi is known for her courageous acts. In the 90’s, she was transferred to Tihar Jail in Delhi as an Inspector General Of Prisons. During her management, she made major changes in the lives of prisoners by introducing meditation programs and literature. This contribution fetched her The Magsaysay Award and heaps of respect. She became a common household name as the anchor of the TV show called Aap Ki Kacheri. Kiran Bedi is recognized as the voice of justice in India and still continues to do remarkable work. It has been more than four decades of her involvement in various social issues of the country formerly as a police officer, and now as an activist. Her inspirational speeches and contributions have encouraged women to join the police forces and take a stand in times of inequity. You can choose to like her or not but can never ignore the phenomenal woman that she is! Next articleThe Mother Who Saves Money For Her Own Funeral!